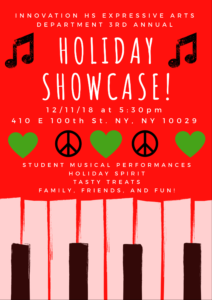 Our annual Holiday Showcase will be this Tuesday, December 11th starting at 5:30. Come spend time with our Innovation Students as the showcase their talents. Brought to you by our Expressive Arts Department.